The Year is 1276, the Year of Four Popes. During these dark and dusty times of Medieval Europe where the core is hospitable and the common cold which bears no cure, two young scientists travel to the New Isles to seek answers. 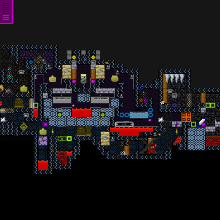 And thus, the Orb which remains intact beneath the shadows of the Chamber of Lilec Gnuu has fallen in their hands. However shall they ever know that great minds think alike, are their minds strong enough to overcome their fears, symbolise the projected route and prepare for an ambush that shall come after that? Or will fear still remain our greatest enemy? My boy, to children who without shan't, compete and seek power beyond their limits, they should ever know that there are most inevitably dire consequences. --- Remastered - 9/21/14 -- Removed 8Bit setting . Updated scenery and placement, added dialogue and level names. Added grapple art first level. Lowered the difficulty by adding more healthpacks.